Notes: The term ‘population centre’ replaces the term ‘urban area’. The rural population for 1981 to 2011 refers to persons living outside centres with a population of 1,000 AND outside areas with 400 persons per square kilometre. Previous to 1981, the definitions differed slightly but consistently referred to populations outside centres of 1,000 population. 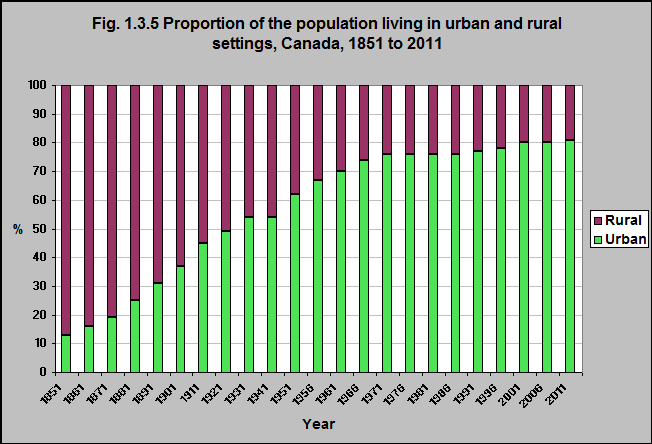 The majority of Canadians – 81% – live in urban settings (2011), reflecting a dramatic increase over the past 150 years. This has remained consistent over the last two decades.